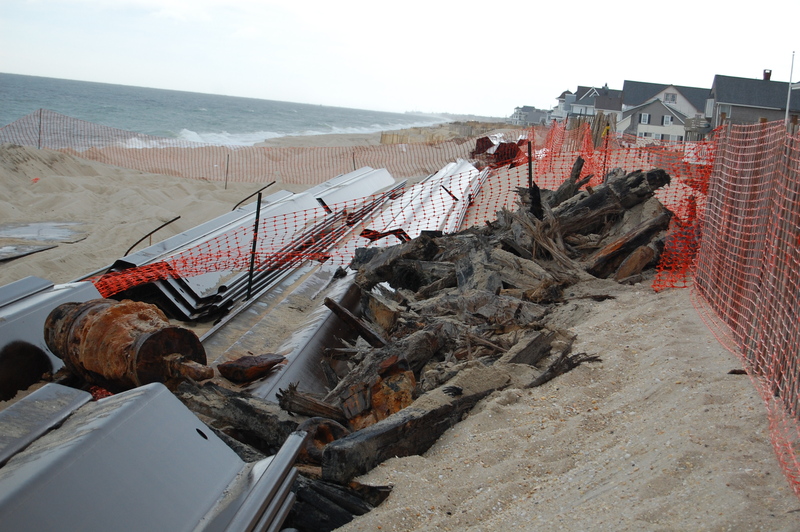 The state Department of Environmental Protection has given the go-ahead for construction of a steel sea wall revetment to resume in the area where a shipwreck from the 1800s was discovered buried in the sand. The shipwreck, thought to be the remains of the Scottish brig Aysrshire, which ran aground Jan. 12, 1850, was found about 15 feet below the sand as the wall was being installed Oct. 31. State historical investigators used ground-penetrating radar and other equipment last month to determine the size of the vessel and if it would be negatively impacted by construction continuing. An analysis of the data gleaned from that investigation showed that continuing construction would not damage the remains of the vessel, said Larry Ragonese, spokesman for the DEP. As a result, installation of the remaining steel sheets – only about 300 linear feet in total – have resumed under the supervision of a maritime archaeologist. The exact identity of the ship remains in question, however. Last week, DEP geologists used electrical resistivity to detect and map subsurface patterns and employed a Geoprobe, a hydraulic machine that drives 2-inch steel boring rods into the ground, in order to glean more information on the vessel. The State Historic Preservation Office is recommending to federal government – which has funded 80 percent of the steel wall construction – that the Geoprobe work continue this month to identify the limits of the structure. A final draft report by the maritime archaeologist will be submitted to state and federal agencies within 12 months, officials said. The revetment itself consists of a 45 foot-high marine-grade steel wall that is driven 30 feet underground to protect the integrity of the barrier island. It runs through all of Brick Township and most of Mantoloking. The 15 feet of the wall that will remain above ground will be covered by a 23 foot-high vegetated sand dune that will serve as a first line of defense during coastal storms.